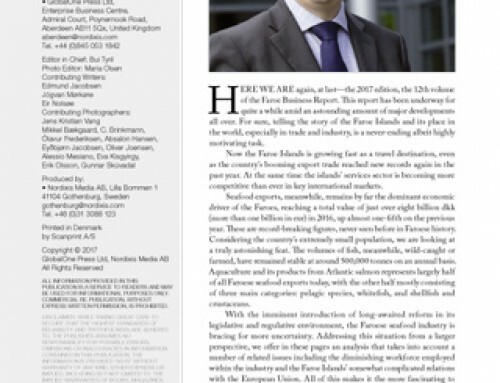 Welcome to the 11th volume of the Faroe Business Report, the 2016 edition of the international review of Faroe Islands industry and trade. 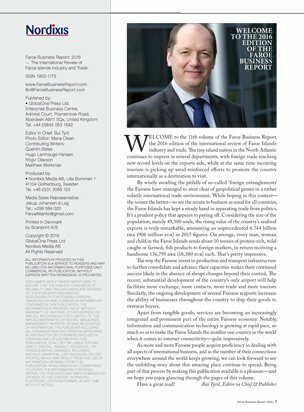 The tiny island nation in the North Atlantic continues to impress in several departments, with foreign trade reaching new record levels on the exports side, while at the same time incoming tourism is picking up amid reinforced efforts to promote the country internationally as a destination to visit. By wisely avoiding the pitfalls of so-called ‘foreign entanglements’ the Faroese have managed to steer clear of geopolitical games in a rather volatile international trade environment. While hoping in this context—the sooner the better—to see the return to business as usual for all countries, the Faroe Islands has kept a steady hand in separating trade from politics. It’s a prudent policy that appears to paying off. Considering the size of the population, merely 49,300 souls, the rising value of the country’s seafood exports is truly remarkable, amounting an unprecedented 6.744 billion dkk (906 million eur) in 2015 figures. On average, every man, woman and child in the Faroe Islands sends about 10 tonnes of protein-rich, wild-caught or farmed, fish products to foreign markets, in return receiving a handsome 136,795 dkk (18,380 eur) each. That’s pretty impressive. 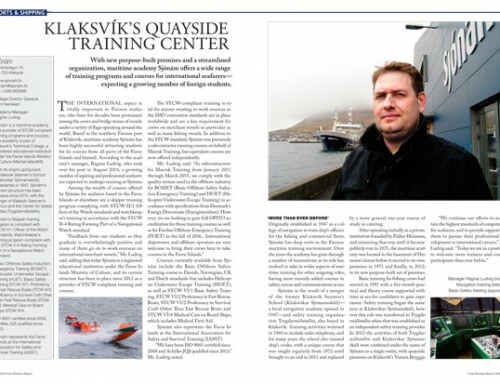 The way the Faroese invest in production and transport infrastructure to further consolidate and advance their capacities makes their continued success likely in the absence of abrupt changes beyond their control. The recent, substantial development of the country’s only airport will help facilitate more exchange, more contacts, more trade and more tourism. 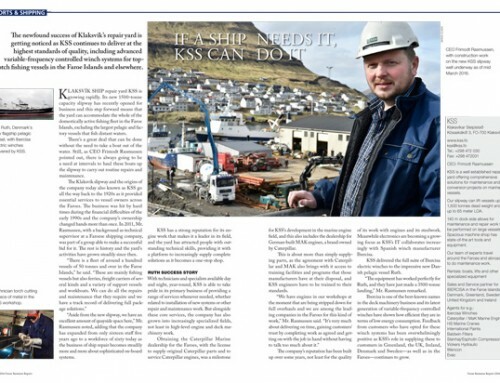 Similarly, the ongoing development of several Faroese seaports increases the ability of businesses throughout the country to ship their goods to overseas buyers. Apart from tangible goods, services are becoming an increasingly integrated and prominent part of the entire Faroese economy. Notably, information and communication technology is growing at rapid pace, so much so as to make the Faroe Islands the number one country in the world when it comes to internet connectivity—quite impressively. 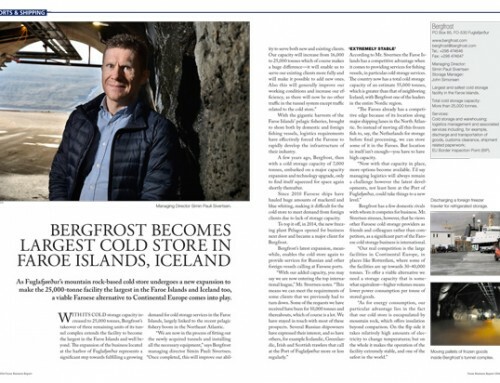 As more and more Faroese people acquire proficiency in dealing with all aspects of international business, and as the number of their connections everywhere around the world keeps growing, we can look forward to see the unfolding story about this amazing place continue to spread. Being part of that process by making this publication available is a pleasure—and we hope you enjoy glancing through the pages of this volume.